We are on day 2 of the backhand challenge to shoot 1000 backhands in one week (if you want to know about future challenges be sure to sign up to our newsletter and Facebook page). After one day of shooting on your own I wanted to deliver some fresh tips for shelfing the puck when you are in close. In this post and video I explain the simple three step process to going top cheese! 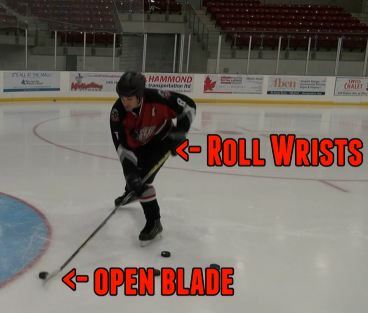 The puck should be positioned forward in your stance to help you get the proper blade angle to lift the puck. A good puck position is not critical, however it does make the shot easier. Good players will be able to lift the puck from various locations, however it’s easier if you start from an easier position and work your way up. The final stage of this shot uses the hands and stick to add power and lift. You will be pushing down with your top hand, and pulling up with your bottom hand (quickly) in order to lift the puck up off the ice. When all three stages are used together (and with a bit of practice) you should have no problem roofing backhands. That wrist pop things is magical. Started getting the feel for it after about 200 shots. Nice, it doesn’t take too long, and now that you have that feeling it will become even more natural and smooth over time. Great lesson! I find the challenges to be motivating, and also enjoyed the “bonus snipes” at the end of the video. I look forward to the backhand tutorial from further distances. It would be great if you include a bonus snipes add on for that video too! As usual, your tutorials rock! As Donnie said, and I really dug the add on at the end with backhands from different positions.